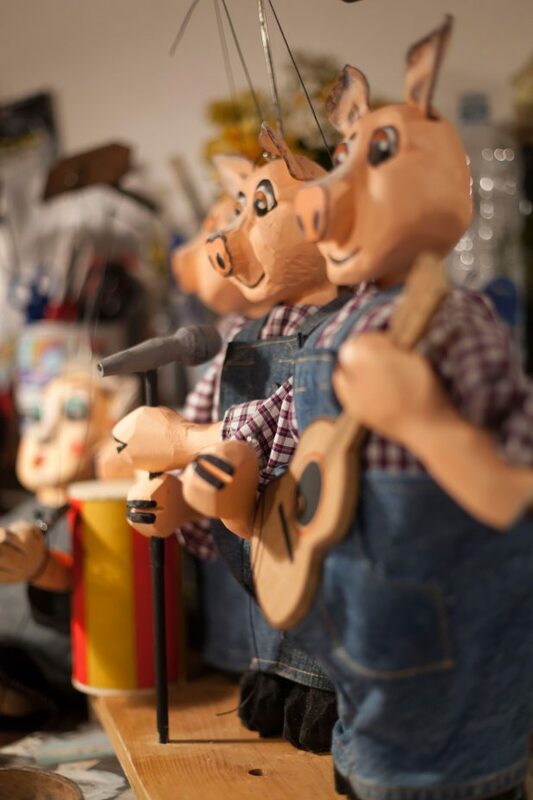 The stage is a little bit like the second home of Damiano Zigrino, he lives it in the foreground as singer of the Jolebalalla and behind the scenes which are backgrounds to the stories of his puppets. But as for the music so is for the theatre of puppets, there is a long preparation before the art can go on stage; from the writing of the texts to the creation of the small and large characters in wood and foam rubber, Damiano Zigrino takes care of each small detail, thanks as well to a scrupulous education beginning with a degree at DAMS in Bologna, and a continuous progression thanks to workshops attended around the world, togather the best of the traditions of other countries. In a certain sense the theatre is in your blood, but when did you understand that it would have played such an important role in your life? «I ate bread and theatre since my first years of life, because my father did various activities in this environment for a long time, as a passion and he genetically instilled in me a love for the stage. 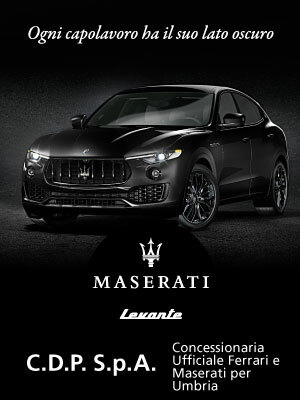 After high school, I enrolled in DAMS in Bologna as an Art major and during a lesson in esthetics we were discussing the pleasure that comes from contemplating works of art, so fascinating in their beauty without time, sublime, without practical implications. Often works will tell stories, but their narration is frozen in an eternal moment, that which the artist captures and makes immortal; following this reflection, I understood that my esthetic pleasure is more tied to the fruition of a work of art than telling a story in time broadened, with a first, a during and an after. What is the work of art that has all these? The theatrical pièce». 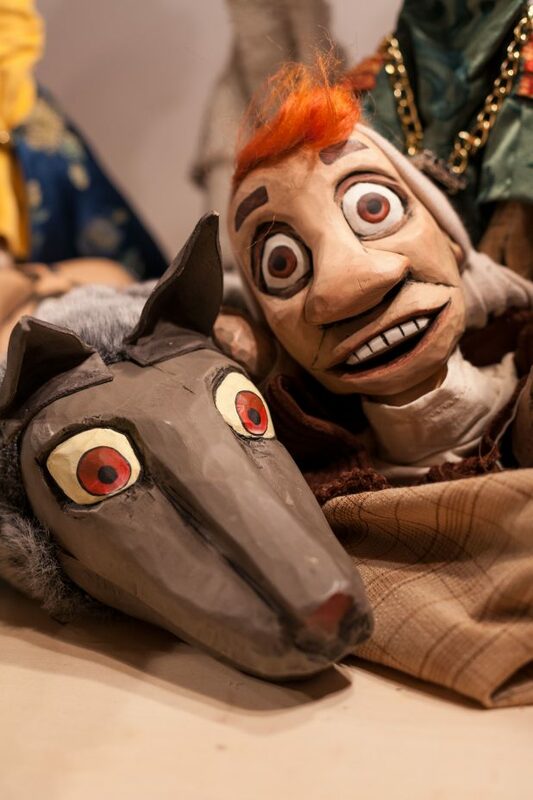 Though puppet theatre was very popular in the past, now the tradition is a bit lost, leaving this art form almost exclusively to shows for children, how did you rediscover it? «Among the courses that I attended during university, there was one that had me particularly interested: Animation Theatre; the course was held by Professor Remo Melloni, who I later rediscovered when I studied at the Accademia Paolo Grassi; he, a great expert of puppet theatre, managed to transmit to me his passion and more than that he awakened in me the curiosity to get to know and explore a world which, too often, is associated only with a children’s audience. Though this is one of its very beautiful characteristics, in reality it is a language very suitable for an adult audience, rather, it is tied deeply to the history of man, because it exists in many cultures, though in different forms». 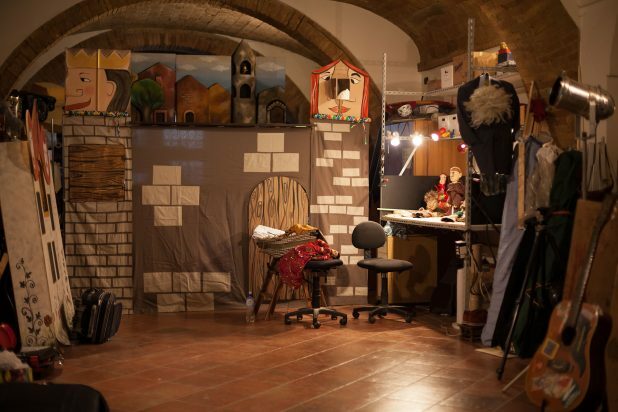 «As soon as I found out about the possibility to attend, in Perugia, a course for Puppet Theatre Operator at the historic Puppet Theatre (TFU), I immediately rushed there, I passed the admissions try-outs, and I had the pleasure of learning from a man of great experience, that is Mario Mirabassi. Having received the highest of marks, at the end of the course, I also had the possibility of collaborating with the TFU in a working manner. After that I attended other laboratories to learn techniques related to the working of various materials: for example, in Prague, a city where the tradition of puppets has very ancient origins, I learned wood carving and building string puppets». Your characters always have a strong personality which they are even able to communicate thanks to a very attentive and creative realization, but how are they born? 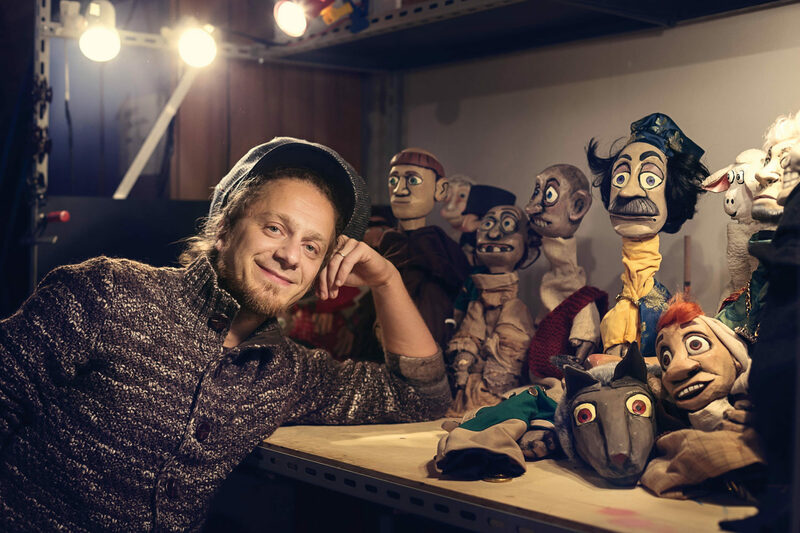 «The first phase of the job is always the research for the right story: whether it is original or readapted, it has characters that I “translate” into puppets. The figure, whether string puppet, hand puppet, doll or simple everyday object, must reflect, in the physical traits, the disposition of the character; therefore, in every phase of the construction, from the sculpting to the creation of costumes, you have to keep in mind this principle. My wife Silvia was given the task of painting the characters and the scenes. The type of story I choose to tell influences the choice of the type of figure as well as the material». As a puppet master as well as theatre teacher, how much does this far-from-secondary activity involve you? «I have always dreamt of working with children, a very receptive audience, demanding, delicate and anything but easy, besides being of extreme importance, because it is about educating the future generations. For that reason, I believe that is necessary to have a knowledge of the most adequate instruments, language and techniques in order to relate to them. In fact, before beginning to work, I attended a course in theatrical pedagogy at the Catholic University of Milan, as well as an improvement course at the Paolo Grassi Accademia in techniques and language for children’s theatre». Damiano is used to dividing himself between his puppets, teaching theatre at school and music (another great passion), this pasta resembles his life a little bit, divided between the stage and school because it is rich in different colours and flavours, distant from one another but perfectly in harmony. While the spinach is lightly cooked in the pan over stir-fried onions in oil, on the side you prepare a pesto blending the walnuts with garlic and rosemary. 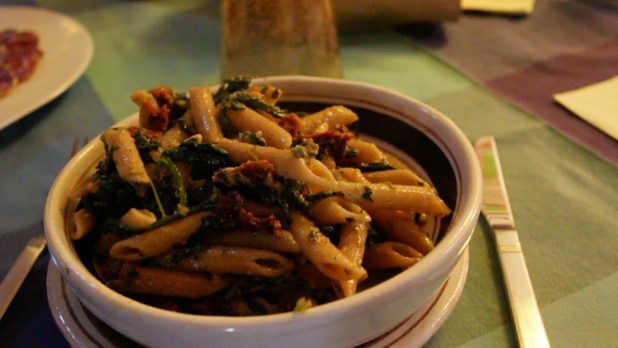 Once the spinach is ready, you add dried tomatoes and it is the time to lightly heat up everything together in the pan, mixing the whole grain pasta with the walnut pesto. A quick dish but full of creativity which Damiano puts on the scene thanks to his characters.